What do i like to shoot ? Mobile phones - now child's play. Watched the Marathi play 'खिडक्या'(Windows) yesterday. Originally, a German play, it has been translated and adapted into Marathi. I will give a 'must watch once' rating! I like plays based on unusual scenarios and uncommon topics. It has been very well directed and both the characters in the play(Jyoti Subhash and Aseem Palande) have done a fantastic job of acting. The script and dialog delivery is excellent. In short, there is nothing that can be removed from the play for the better. The play depicts how dementia (cortical, most probably) brings about changes in the life of a cheerful grandma living with her rather inactive husband and interacting on-and-off with her daughter's son. The play is set in current times. Details have been planned and executed pretty accurately from start to finish. The slow introduction of non-sensibility into grandma's dialogues must not have been easy to accomplish. 'खिडकी' has been used as a metaphor. Once referring to an actual window, and later on, to the Internet. Through the खिडकी (window), the character seeks attention and interest from other people around, to bring colour to her dull, monotonous life. My interest in photography rose by a considerable amount in the last couple of years, more so in the last 7-8 months. Photography is an excellent way to vent and gradually give a boost to the creativity in oneself (whatever little one might have). Through this post i wish to record (primarily, for my own reference down the line) what I like to shoot. As with most people I started liking to take snaps whenever I found good landscapes, rainbows, beaches, sunrises and sunsets. These are places/times where the photographer can get an aesthetically good looking shot without too much effort. The colours and composition almost always looks nice when there is a rising sun, clouds, mountains and a sea-shore or river in it! Another reason why everyone gets those shots beautiful is because camera manufacturers know that they have to get those shots right and so they design and test the cams to bring out the best in those kind of scenes. Also, for a landscape, one (usually) focuses at infinity so there does not arise the question of what aperture value(f-number) to use to get the correct depth-of-field. After my interest in landscapes I got interested into flowers. Tried various things - shooting with different angles, from various perspectives, zooming-in & out etc. Although inherently beautiful, flowers are slightly difficult to shoot than landscapes. The focus has to be perfect and images sharp. Shooting dark flowers (purple, deep red, deep magenta) requires ample light, otherwise you have to bump up the ISO to get a steady click. The DOF has to be just right to get a dramatic effect. After flowers, I have developed interest in creating photos with everyday objects. I like to express concepts through commonly found/seen objects. Such photos often have no 'beauty'(in the usual sense) in it but, they might convey a message or thought. From my experience, creating them is not easy. Since there is no beauty, there is no right angle, right perspective, right light or right DOF. Everything is in the hands of the photographer. Even the objects in frame are at the mercy of the photographer. He may alter the composition at will. He can manipulate the light by using reflectors and strobes. Manipulating lights implies manipulating highlights and shadows, which gives further control over the end image. In this genre of photography there is a lot of scope for producing creative pictures and, I think there is lot for me to learn there. So, I'm going to stick to it for the near future at least. Does every hobbyist photographer follow the same path ? Nope. Not necessary. There are more people with mobile phones in India than with basic sanitation. To say that mobile phones have become ubiquitous will be an understatement. But, this post is not about the omnipresence of mobile phones. This is about another very interesting effect of mobile phone penetration that i observed recently. The other day, I was parking my bike in my building after I'd returned from office. Just then, I heard, the small boy (aged 5-6) who lives on the first floor saying something like 'Hello, I am leaving in half an hour and will reach office by 10.' Another one said 'Come quickly, we are waiting'. After a few seconds, the second one inquired 'Hello, why are you not here yet ?'. The first one said 'There are guests at home'. After a moment, the first one said 'Hello, I am leaving now'. When i went near them, i saw that these guys were talking on (imaginary) mobile phones with each other! I stayed there for some more time, and saw that their plays were all centered upon mobile phones. They would take up different roles every time and call each other to ask something or the other on the phone. This continued on and on. At such young age, mobile phones have not only entered their life, they have secured a firm position in their day-to-day life. Growing up, I think they will not be able to imagine a world without mobile phones, the same way that people from my generation assume television or radio. Last to last Sunday, we went to Kalyan for my brother's engagement. The programme went well... well... only until we were returning back to Pune. A few kilometers before Lonavla our bus's fan belt broke and we were left stranded on the expressway. It was dusk already and vehicles going by had their lights on. Luckily I had my camera with me so,I decided to take capture some light trails. Unfortunately, i had not carried my tripod, so i had to take all the shots handheld. It was a learning experience. 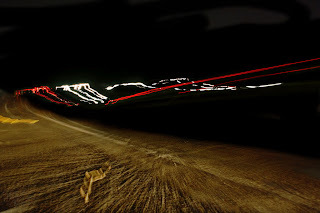 The red streaks are the tail lamps of cars passing by me. The head lamps of incoming vehicles can be seen in bright. This is a 3.2 second exposure at f/8. Simple long exposures were coming too ordinary. So, I decided to zoom out the lens during the exposure. I think that is what has made the difference. The texture formed at the bottom is a result of the zooming. I think, I started with around 35mm and zoomed out to 18. I wanted an object an object to appear close to the camera(to underline the visual effect of the zoom), so after a bit searching around, found the twig that you can see near the bottom. The yellowish light is the light coming from the parking lights of our bus parked by the side. Fortunately, it was not too strong to light the entire road and coming vehicles. Choosing the aperture value is an important part, especially when shooting trails from close. Because a smaller value (i.e larger aperture) can get you out of focus areas as the vehicle moves further. A larger value (i.e smaller aperture) won't let in enough light to get clear details in the short interval that the vehicle passes by you. In fact, this same thing happened to me. I, then, bumped up the ISO to 400 as a compensation. 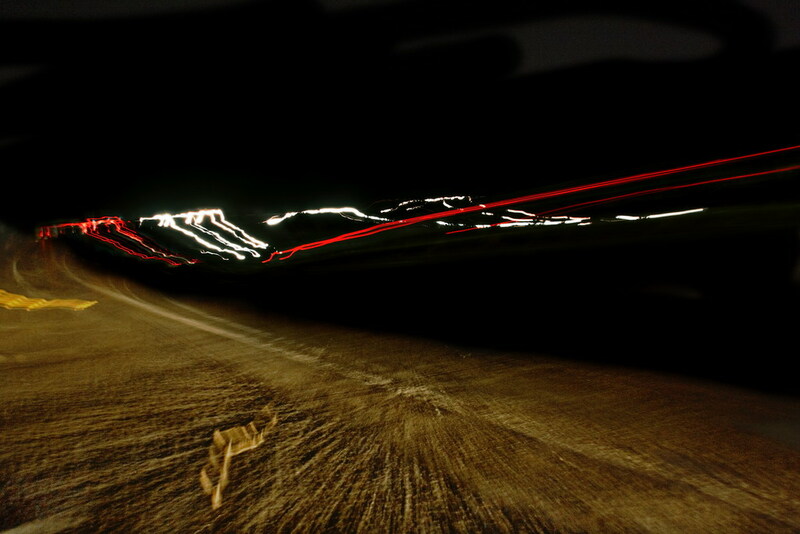 Another problem to be faced when taking light trails from close is that - the light from the head lamp of the vehicle the tail lights of which you want to capture also might come in the picture and blow out the darker details. This happens because you are standing close to the vehicle. The remedy is to angle the camera in such a way that the vehicle does not come into view until it has gone some distance away from where you are standing. Trial-n-error is the best way to figure out what angle works best.